She continued to hold office during the reign of Rimush, her brother, when she was involved in some form of political turmoil, expelled, then eventually reinstated as high priestess. Her composition 'The Exaltation of Inanna' or ‘nin me šara’ details her expulsion from Ur and eventual reinstatement. This correlates with 'The Curse of Akkade' in which Naram-Sin, under whom Enheduanna may have also served, is cursed and cast out by Enlil. After her death, Enheduanna continued to be remembered as an important figure, perhaps even attaining semi-divine status. In 1927, British archaeologist Sir Leonard Woolley discovered the Enhuduanna calcite disc in excavations of the Sumerian city of Ur. The figure of Enheduanna is placed prominently on the disc, emphasizing her importance. Woolley also uncovered the temple complex where the priestesses were buried. Woolley described Enhuduanna in a one-page summary in his "Excavations at Ur", but the significance of Enheduanna was not generally recognized until Adam Falkenstein published "Enhedu'anna, The Daughter of Sargon of Akkad", the first scholarly article on Enheduana in 1958, followed by Hallo and Van Dijk publishing the first translations and book-length discussion of Enheduana's work in 1968. Enheduanna is well known from archaeological and textual sources. Two seals bearing her name, belonging to her servants and dating to the Sargonic period, have been excavated at the Royal Cemetery at Ur. In addition, an alabaster disc bearing her name and likeness was excavated in the Giparu at Ur, which was Enheduanna's main residence. The statue was found in the Isin-Larsa (c. 2000–1800 BC) levels of the Giparu alongside a statue of the priestess Enannatumma. Copies of Enheduanna's work, many dating to hundreds of years after her death, were made and kept in Nippur, Ur and possibly Lagash alongside Royal inscriptions which indicates that they were of high value, perhaps equal to the inscriptions of Kings (Westenholz 1989:540). Enheduanna composed 42 hymns addressed to temples across Sumer and Akkad including Eridu, Sippar and Esnunna. The texts are reconstructed from 37 tablets from Ur and Nippur, most of which date to the Ur III and Old Babylonian periods (Sjöberg and Bergman 1969:6–7). This collection is known generally as 'The Sumerian Temple Hymns'. The temple hymns were the first collection of their kind; in them Enheduanna states: "My king, something has been created that no one has created before." The copying of the hymns indicates the temple hymns were in use long after Enheduanna's death and were held in high esteem. Her other famous work is 'The Exaltation of Inanna' or 'Nin-Me-Sar-Ra' which is a personal devotion to the goddess Inanna and also details Enheduanna's expulsion from Ur. 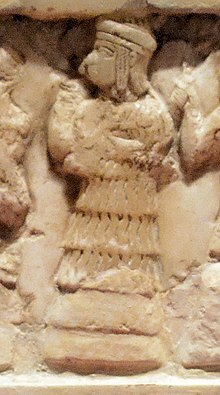 Enheduanna's poems played a role in cementing the syncretism between Inanna and the Akkadian goddess Ishtar. Enheduanna's authorship raises the issue of female literacy in ancient Mesopotamia; in addition to Enheduanna, royal wives are known to have commissioned or perhaps composed poetry, and the goddess Nindaba acted as a scribe: As Leick notes "to some extent the descriptive epithets of Mesopotamian goddesses reveal the cultural perception of women and their role in ancient society". The majority of Enheduanna's work is available in translation at the Electronic Text Corpus of Sumerian Literature. Nin-me-šara, "The Exaltation of Inanna", 153 lines, edited and translated first by Hallo and van Dijk (1968), later by Annette Zgoll (1997) in German. The first 65 lines address the goddess with a list of epithets, comparing her to An, the supreme god of the pantheon. Then, En-hedu-ana speaks in the first person to express her unhappiness at being exiled from the temple and the cities of Ur and Uruk. En-hedu-ana asks for intercession of Nanna. Lines 122–135 recite divine attributes of Inanna. In-nin ša-gur-ra (named by incipit), 274 lines (incomplete), edited by Sjöberg (1976) using 29 fragments. The Temple Hymns, edited by Sjöberg and Bergmann (1969): 42 hymns of varying length, addressed to temples. Ancient Sumerian bas-relief portrait depicting Enheduanna (third from right). Studies of Enheduanna were limited to Near Eastern scholars until 1976, when American anthropologist Marta Weigle attended a lecture by Cyrus H. Gordon and became aware of her. Weigle introduced Enheduanna to an audience of feminist scholars with her introductory essay to an issue of Frontiers: A Journal of Women Studies. Entitled "Women as Verbal Artists: Reclaiming the Sisters of Enheduanna", it referred to her as "the first known author in world (written) literature". In 1980, Aliki and Willis Barnstone published a translation of "Ninmessara" in a more accessible (non-scholarly) form in their anthology A Book of Women Poets from Antiquity to Now. In 1983, Diane Wolkstein and Samuel Noah Kramer included English translations of several of Enheduanna's poems in their book Inanna: Queen of Heaven and Earth, a compilation of ancient Sumerian poems about the goddess Inanna. Wolkstein's adaptation became the basis of various other publications, including Judy Grahn's Queen of Swords (1987) Alice Notley's The Descent of Alette (1996), and Annie Finch's Among the Goddesses (2010). Jungian analyst Betty De Shong Meador in 2001 translated works by Enheduanna and wrote two books on the subject: Inanna: Lady of Largest Heart and Princess, Priestess, Poet: The Sumerian Temple Hymns of Enheduanna. Minnesota author Cass Dalglish published a "contemporary poetic adaptation" of Nin-me-sar-ra in 2008. Being not only the earliest known poet in world history, but also one of the earliest women known to history, Enheduanna has received substantial attention in feminism. To mark International Women's Day in 2014, the British Council hosted a pre-launch event for Niniti International Literature Festival in Erbil, Iraq, where "writer and previous NINITI participant Rachel Holmes [delivered] a TED Talk looking back on 5000 years of feminism, from major female Sumerian poet Enheduanna, to contemporary writers who [attended] the festival". In 2017, London and Oxford Professor of Ancient Near Eastern History Eleanor Robson described Enheduanna as "a wish-fulfillment figure...a marvellously appealing image". Enheduanna is the subject of the episode "The Immortals" of the science television series Cosmos: A Spacetime Odyssey, where she was voiced by Christiane Amanpour. In 2015, the International Astronomical Union named a crater on Mercury after Enheduanna. ^ Binkley, Roberta (1998). "Biography of Enheduanna, Priestess of Inanna". University of Pennsylvania Museum. [unreliable source?] "ca. 2285–2250 B.C.E." ^ Gods, Demons, and Symbols of Ancient Mesopotamia: An Illustrated Dictionary by Jeremy Black and Anthony Green (1992, ISBN 0-292-70794-0), p. 134 (entry "Nanna-Suen"). ^ Hallo and Van Dijk 1968 p. 3. ^ J Renger 1967: "Untersuchungen zum Priestertum in der altbabylonischen Zeit", Zeitschrift für Assyriologie und vorderasiatische Archäologie. Vol. 58. p. 118. ^ Mark, Joshua J. "Enheduanna", Ancient History Encyclopedia, March 24, 2014. Retrieved June 25, 2017. ^ a b Woolley, Leonard. Ur Excavations II: The royal cemetery: a report on the pre-dynastic and Sargonid graves excavated between 1926 and 1931". For the Trustees of the two Museums by the Oxford University Press, Oxford, 1934 p.312, 334–335 & 358. ^ Woolley, C.L., Excavations at Ur, p.115. ^ Falkenstein, A., "Enhedu'anna, Die Tochter Sargons von Akkade," Revue d'Assyriologie et d'archéologie orientale, Vol. 52, No. 2 (1958), pp. 129–131 (in German). JSTOR link. Retrieved 25 June 2017. ^ a b c Hallo, William W. and Van Dijk, J.J.A., The Exaltation of Inanna, Yale University Press (1968). ^ Weadock, P. 1975, "The Giparu at Ur," Iraq 37 (2), pp. 101–128. ^ Weigle, Marta (Autumn 1978). "Women as Verbal Artists: Reclaiming the Sisters of Enheduanna". Frontiers: A Journal of Women Studies. 3 (3): 1–9. JSTOR 3346320. ^ Enheduanna Research Bibliography (2001). Accessed 25 June 2017. ^ Wolkstein, Diane and Samuel Noah Kramer. Inanna: Queen of Heaven and Earth: Her Stories and Hymns from Sumer. Harper & Row, NY 1983. ^ Mercury Crater-naming Contest Winners Announced, IAU, press release, April 2015. The crater will appear in the IAU's Mercury gazetteer in due course. Dalglish, Cass (2008). Humming the Blues: Inspired by Nin-Me-Sar-Ra, Enheduanna's Song to Inanna. Oregon: CALYX Books. ISBN 978-0-934971-92-8. Sjoberg, Ake and E. Bermann, E. (1969). The Collection of the Sumerian Temple Hymns, Locust Valley, J.J. Augustin. Sjoberg, Ake (1975). In-nin sa-gur-ra: A Hymn to the Goddess Inanna by the en-Priestess Enheduanna, Zeitschrift für Assyriologie und Vorderasiatische Archaeologie 65: 161–253.